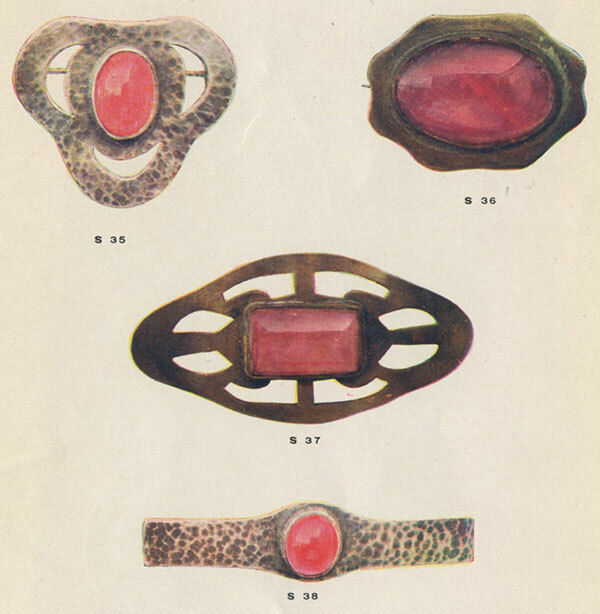 Miners and Cutters of Tourmalines and Other California Gems and Manufacturers of Handwrought Articles for Home and Personal Adornment, In Metals and Leather, and Set With Gems. With Pala Presents, we offer selections from the library of Pala International’s Bill Larson, who shares with us some of the wealth of information in the realm of gems and gemology. The following, anonymously authored, booklet was published circa 1915 by the Pala Chief Gem Mining Company of San Diego, California. 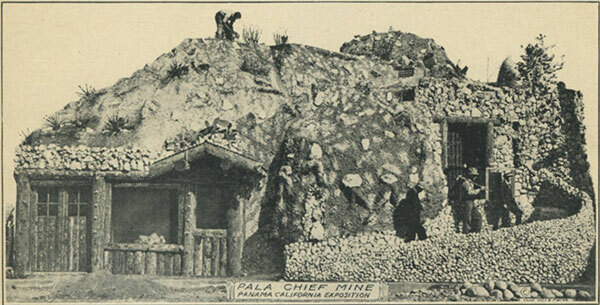 THE PALA CHIEF GEM MINING COMPANY has placed on the grounds of the San Diego Exposition, which will be maintained throughout the entire year of 1915, an exhibit representing, in faithful detail, the famous Pala Chief Gem Mine, located in the Pala Mountains, seventy-five miles north of the City of San Diego. In this wonderful exhibit is shown the method of mining the tourmalines, and many remarkable specimens of the beautiful gems in the rough. Visitors pass through tunnels like those dug by the miners in the mountainside, and see embedded in the natural rock brought from the mine the huge crystals, or Spodumene, just as they are found in Nature. CALIFORNIA is the greatest gem producing state of the United States, and San Diego county is the leading gem producing county of the state. This county, lying in the extreme southwestern part of California, is often called “the gem casket of America.” Diamonds are the only precious stones not found in this remarkable region, the gem-producing section of which is confined to an area of not more than five miles wide and twenty-five miles long. In this limited area are found tourmalines, kunzite, topaz, beryls, rubellites, garnets, hyacinths, and aquamarines. Kunzite, the wonderful gem that is like the diamond, and almost equals it in hardness, is found nowhere else in the world but in the Pala Chief mine. Of all these various gems of San Diego county, tourmalines are fast becoming the most popular, for there are fads in gems, as in nearly everything else, and tourmalines have caught the popular fancy and have come to stay. They present the most fashionable shades of color at the present time. It is no wonder that this is so, for the tourmaline is one of the most beautiful of gems, and its remarkable variations of color lend themselves to the making of individual designs in jewelry, and harmonize with any of the metals used in every style or form of craft work for home or personal adornment. 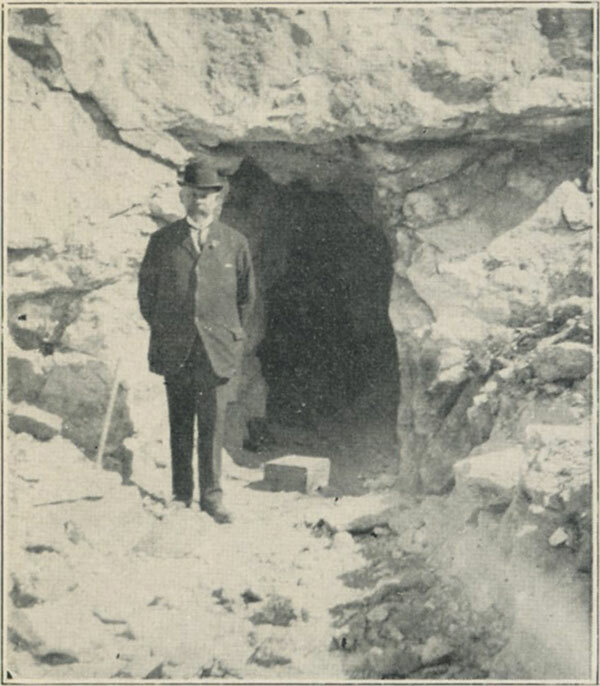 Dr. George F. Kunz, with Tiffany & Co., gem expert of America, at entrance to Pala Chief Gem Mine, in San Diego County, California. 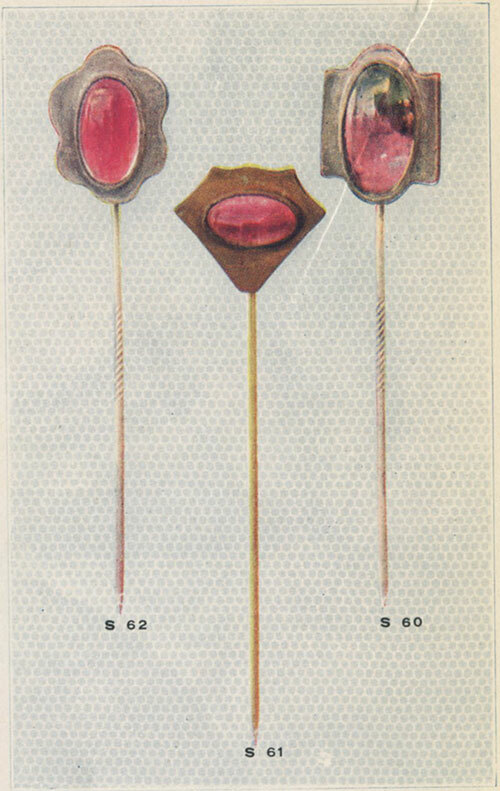 The tourmaline is a semi-precious stone, and no more beautiful gem comes out of the ground. In color it rivals the ruby, and in hardness it is almost equal to the diamond. Of all of the gems the tourmaline has the greatest variety of tints, various specimens shading from ruby red to emerald green, with intermediate shadings of red, green, yellow and pink. Some are much like the emerald; others show the yellow lustre of the topaz, and still others might be sold for rubies. All have a pure translucence; like a dewdrop when it glistens in the sunlight. “Tourmaline Queen Mine:—The Tourmaline Queen Mine lies near the top on the east side of the same mountain as the Stewart Mine, and about one-half mile northwest of it. Beautiful pink tourmaline, green in some portions, has been obtained in this mine, along with the feldspars, lepidolite, black tourmaline, garnets, etc. The main ledge in this mine is 10 to 15 feet thick, though at the place opened it appeared to be only a foot or two thick. The principal work consists of two open cuts of but moderate size. 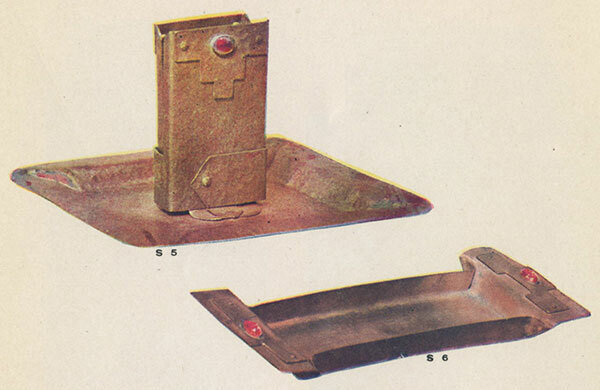 Both of these mines are owned and operated by the Pala Chief Gem Mining Company, of which Mr. Frank A. Salmons is president and principal owner. Mr. Salmons was their discoverer, and it was only ten years ago that he found them. The workings of a colony of red ants helped him to make the wonderful discovery. Salmons was proprietor of a trading post on the reservation of the Pala Indians. Pala was, and still is a sleepy little place, in a high-up valley, through which flows the San Luis Rey river. Once it was said of Pala that no spot on the map of California could be more secure in its atmosphere of repose. It seemed impossible that any notable thing could ever come out of Pala. But when the mine of sparkling gems was found it seemed as if the unremitting sunshine of the place had crystallized below the cactus-bearing sands. Having the instincts of a prospector, Salmons passed a great deal of his time among the hills. Years ago he discovered the famous lithia and lepidolite mines of Pala, which have long since passed into the hands of the American Lithia Chemical Co., and are now being extensively operated, and the ore shipped in large quantities to New York. One day he was following an outcropping ledge of peculiar formation, when he observed a sandy pyramid formed by red ants. He was about to pass this anthill, when, on the side of it where the sunlight fell his eyes caught the flash of a ruby ray of light. He followed this with his eye to its source and found a beautiful pink and green crystal which he knew to be a tourmaline. He straightway filed on the claim, and began to dig there. Soon he unearthed a mass of gems. The mountain in which the Pala Chief Mine is located is of volcanic origin, and the gem-stones are found embedded in a reddish, ash-like substance, a single block of which may contain tourmalines, kunzite, rubellite beryl, and other crystals as yet unclassified. 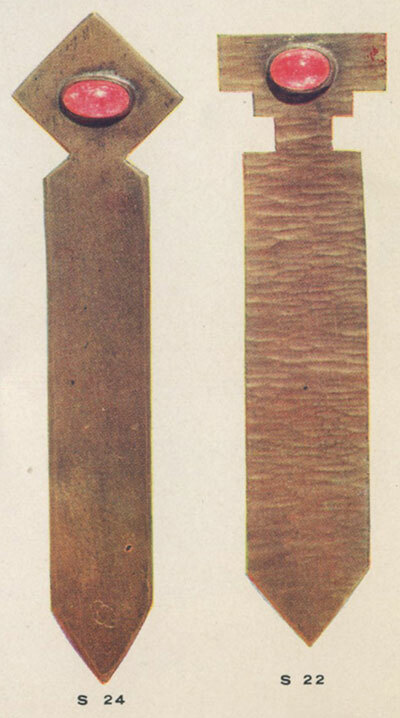 Tourmaline comes in pencils or crystals of uniform shape, though of varying size. Many noted scientists from all over the world have visited the tourmaline mines at Pala since their discovery, and much has been written about them, both in a scientific way and otherwise. 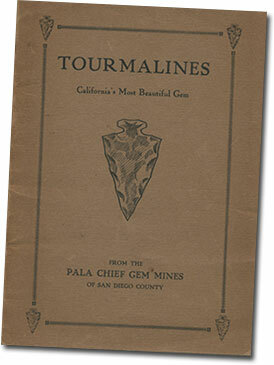 All agree that the tourmaline mines of San Diego county are the most wonderful of any in the world, and the most valuable from the point of production of gems. 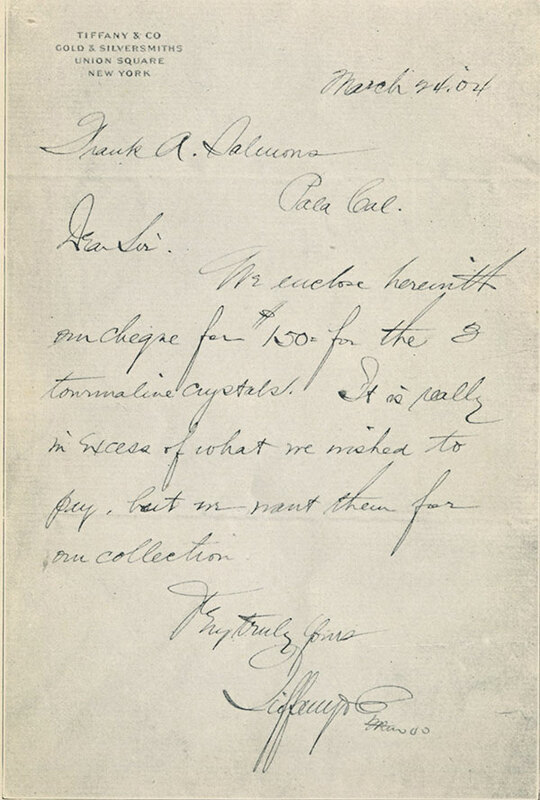 One of the checks from Tiffany & Company, for rough gems from Pala Chief Gem Mine, San Diego County, California. Not only the largest manufacturing jewelry firms of America, but those of Europe, are eager for the output of the Pala Chief Gem Mine of San Diego county. Many superb gems have already been sold to the New York, London, Amsterdam and Paris dealers. Tiffany & Co., of New York, being one of the heaviest purchasers of gems from this mine. Now, for the first time, these beautiful stones are offered to the public direct from the miner and the manufacturer of the beautiful and artistic articles in which they are set. 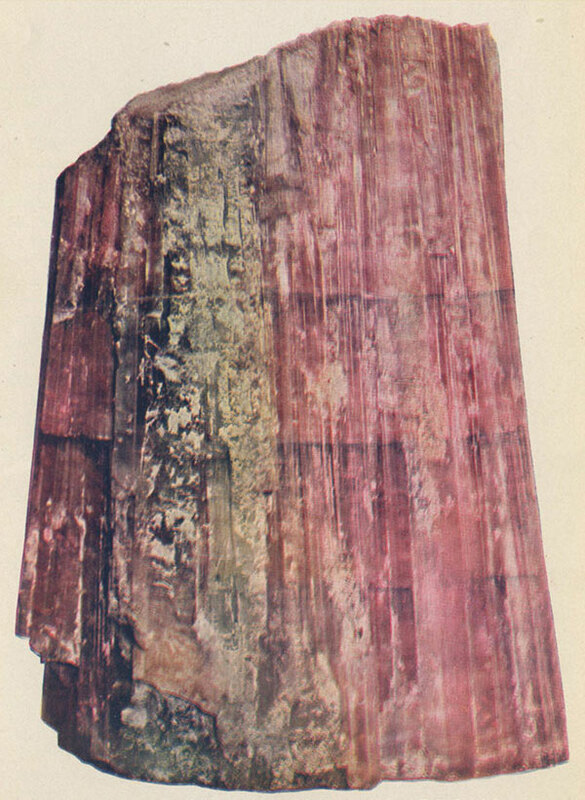 Largest Rough Tourmaline in the world—weight 6 pounds, from Pala Chief Gem Mine. 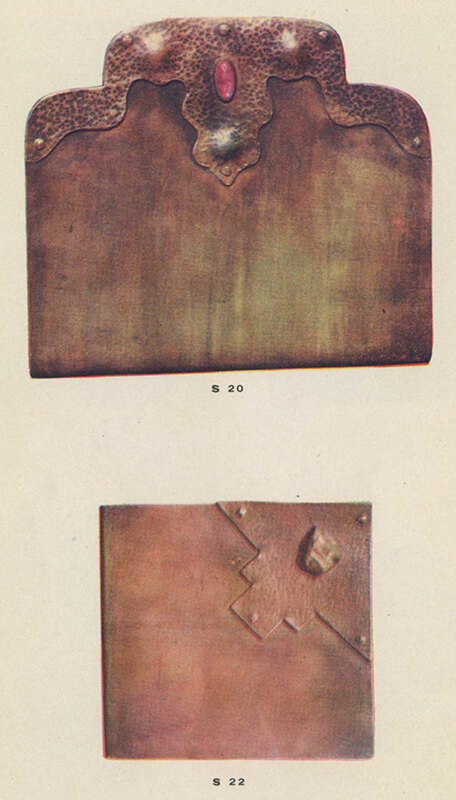 A request of our readers: Have you seen any of the copper or sterling objects contained in the catalog below? If so, we want to hear from you. 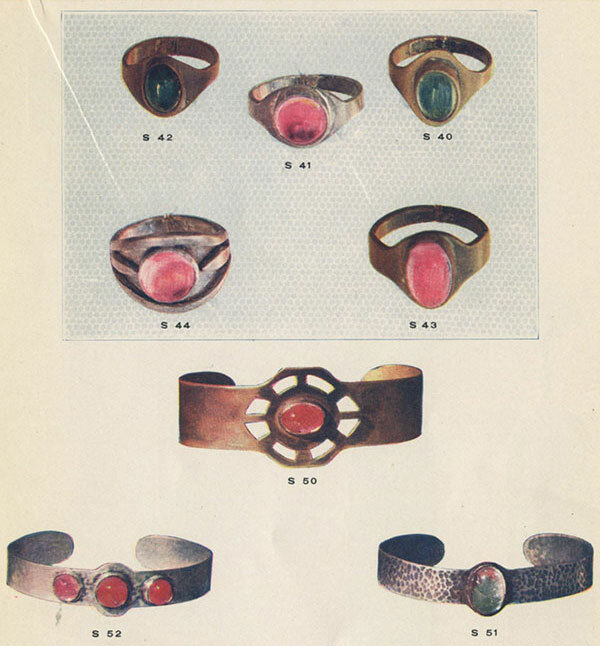 Artistically designed articles for the home and for personal adornment, set with beautiful tourmalines from the Pala Chief Gem Mines of San Diego county, will be sent by mail to those who desire to purchase them, with the privilege of examination before final decision. 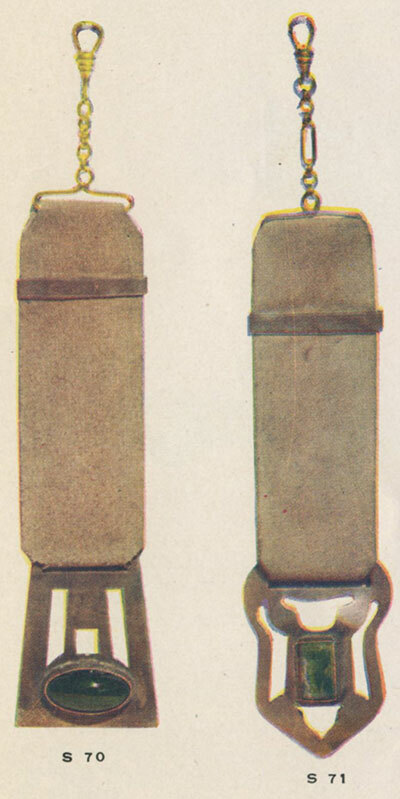 From the designs shown on the foregoing pages anyone may select by number from one to three articles, and these will be sent to the address given in the request to us in such a manner that they may be inspected before the money is paid for them. Any one of the articles sent, or all of them, may be kept. Those not desired may be returned to us, and no charge will be made for the privilege of examination. Select those you wish to have sent for examination by number and write to us to send either one, two or three of the articles in the manner described above. Let us say that the endeavor to cultivate a taste for the artistic in a practical art has been fully demonstrated in the craftwork we are offering. A most discriminating public has been quick to respond to the beautiful work. 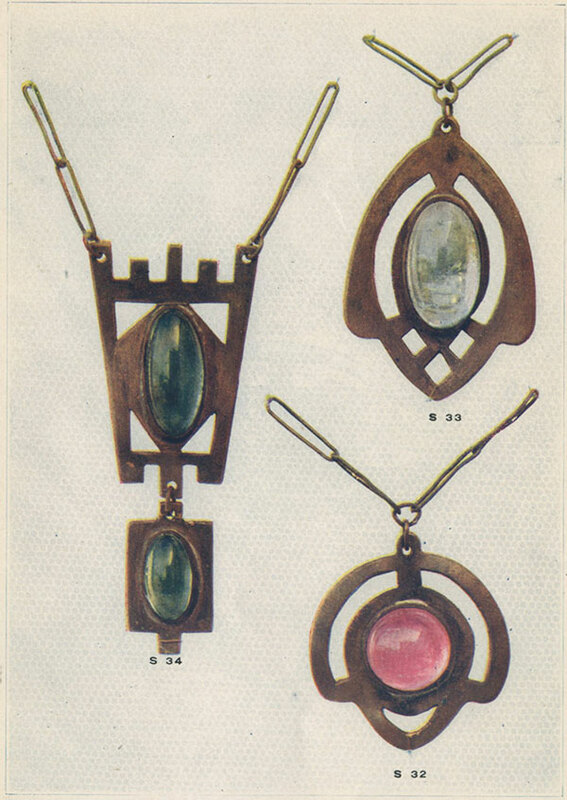 With a corps of skilled workers we are able to execute, in our shop, a wonderful variety of exclusive and original designs of artistic and practical articles of copper and silver, and using a gem from our own mine-the tourmaline. 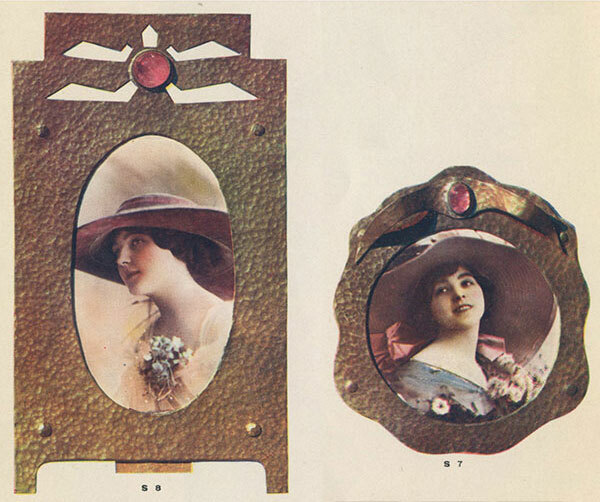 This gem is so beautiful in color, and so brilliant, that it is ideal for craftwork. 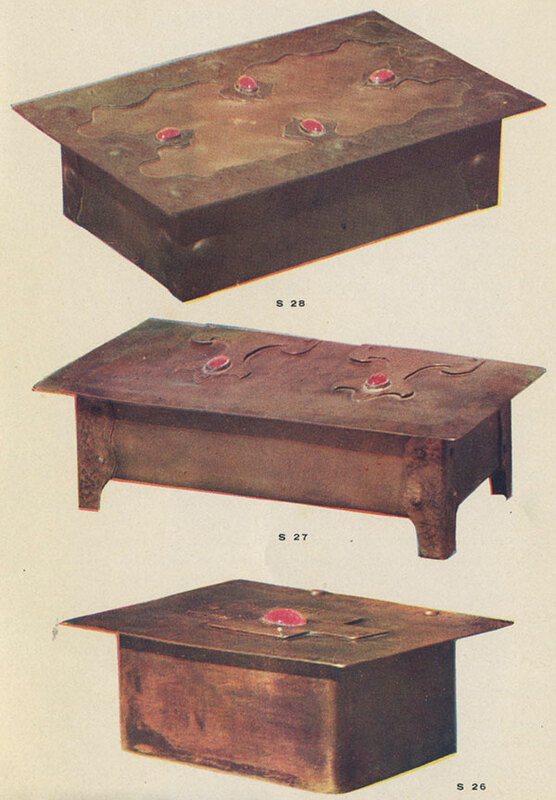 Modern home-furnishing calls for this work, and the decorative opportunities are many. 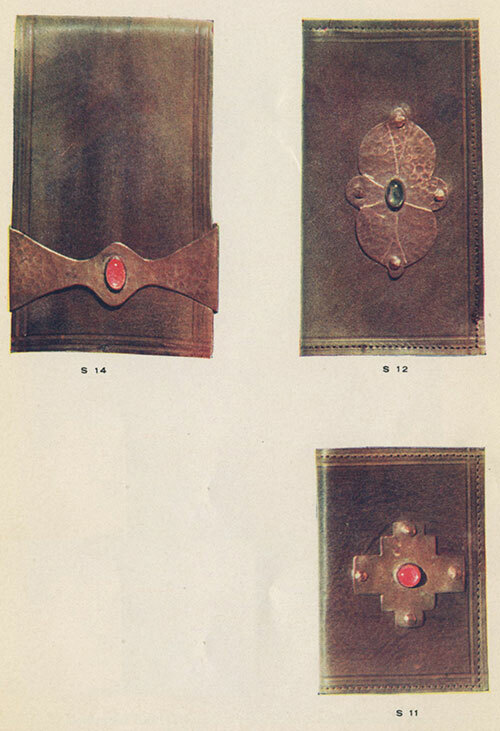 Hand-colored leather bags with special designs in handwrought metal, rings, brooches, pendants, bracelets, jewel caskets, desk furnishings, smoking sets, photo frames, serving trays and many other articles, set with the pink and green tourmalines, make this original combination very popular. The beautiful blending of the colors of the metal in repousse and pierced design is most interesting and wonderful. Lovers of handcraft will be pleased to know that a great variety of articles, thoughtfully designed and executed, may be obtained on application. 217 Timken Building, San Diego, California.